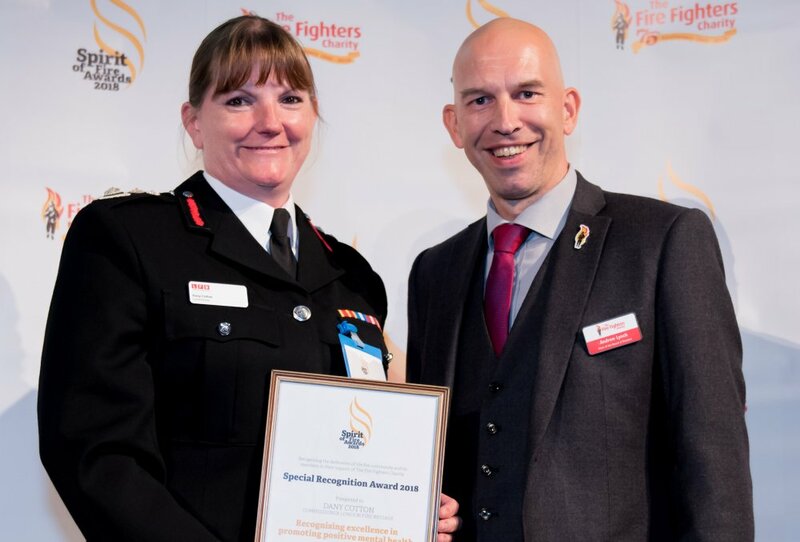 London Fire Brigade Commissioner, Dany Cotton, today received a special recognition award at The Fire Fighters Charity’s Spirit of Fire Awards in recognition of her contribution in promoting positive mental health across the fire community over the last 12 month. Held at One Great George Street in Westminster, the Spirit of Fire Awards recognised the support and dedication of firefighters and fire and rescue service personnel from across the UK. The event, which saw the presentation of 11 awards – including the Special Recognition award for the Commissioner of London Fire Brigade, was followed by a reception at No.10 Downing Street that was hosted by Home Secretary, Rt Hon Sajid Javid MP. The Special Recognition Award was presented to the Commissioner by Chair of The Fire Fighters Charity, Andrew Lynch, who gave a speech ahead of the award presentation, stating that: ‘In the days that immediately followed the Grenfell Tower fire, and in the weeks and months since, London Fire Brigade Commissioner, Dany Cotton, has spoken openly and honestly about how she was affected by the things she witnessed that night, how she felt an overwhelming sense of responsibility for her teams involved and how she sought professional counselling in the wake of Grenfell Tower to help her come to terms with these feelings. Dany’s openness about her own feelings has opened the door for others to admit to how their experiences have had an impact on their own well-being. The Spirit of Fire Awards ceremony – which falls in the 75th anniversary year of The Fire Fighters Charity – was hosted by BBC Newsreader, Nicholas Owen. Following the ceremony, nominees and winners walked the short distance to Downing Street to attend a reception at No.10 Downing Street, hosted by Home Secretary, Rt Hon Sajid Javid MP.